This is exactly the type of store I would have loved to discover near my apartment in Seattle. I lived in a densely populated urban setting and had no car; my feet and the city bus were my ticket to anywhere I needed to go. For the most part this worked out just fine. There were a couple of nurseries within walking/busing distance and when you live in apartment you only have so much space available to plant anyway. I’m spoiled now, both with quick personal transportation and land available to plant in. 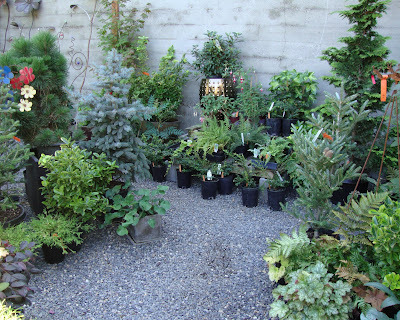 My visit to Oxalis in NW Portland provided a little jolt of memory, causing me to recognize just how much my life, and my garden, has changed over the years. Oxalis is located in a converted old home in a densely populated inner-city neighborhood. The front yard design gives you an accurate read on the type of plants and garden art that you will find within. "Alice the Ox"…. (see it? In the top of the gate?)….. "Oxalis"….is somebody having a little fun with words? The front porch is full of small planters and succulents. …and a window full of interesting succulent shapes. ….and below (and while I was enjoying the sunshine it certainly doesn’t make for great photos does it?). And a to-die-for (very heavy!) table and stool set. Love its chunky style! An apple! …and if this espaliered tree were really producing we’d see both Granny Smiths and Yellow Delicious! Sale! I love a sale corner….especially when the signs are this good looking. Something wonderful must be there…. Not as affordable, but very cool, are these metal flowers and trellis squiggles. And the ultimate in nursery/boutique recycling? Shoe box tops as plant boxes! I REALLY like this place! I wish I had the $$$ to set it up in the empty (small) library building next door to us! What an inspiring concept! Looks like a nice store. Funny thing about the name, though, down in the Bay Area a type of oxalis is the biggest problem weed for many gardeners. Other types of oxalis like the native one are great, so the name doesn't only have negative connotations down here. But when I saw a blog post titled oxalis I expected it to be a weeding saga, not some appealing photos of a charming store. I love that this was a house! What a great idea! They have some pretty cool looking plants! I'm sure you know my feeling on those turquoises pots. I've been having a strong urge as of late for a fruit tree. I attended a grafting class once and fell in love with grafted apples. An espalier grafted apple tree, now that is something to drool over! I would love a store like this. Why can't I find chairs, tables, heck, even great summer sandals when I go plant shopping? Stores like this always make me want to set up one of my own. Much applause for Oxalis. Shucks ! I missed this one ! And my fabulous find from Xera (Portland Nursey) , a variegated moor grass (Molinia caerulea 'Variegata' was confiscated at the the border this morning. Sheesh. Liza, there must be something like this near you?! Rebecca, can you even imagine how much fun you would have? ryan, omg....we've got it up here too. It's such a nightmare!!! When I first saw the name of the store I was thinking the same thing. But then as I shopped that thought kind of fell by the way side. Laura, I am seriously considering that apple tree. It would be so cool to have it in our garden! Les, they are cool eh? ks, no!!!! OMG, the folks at California Cactus Center and San Marcos Growers both warned us of border issues, but coming back into Oregon was clear sailing, we weren't even stopped. So were there many of them? Do you think it would ship well if I were to get one and send it to you? James, ya....I couldn't even lift the stool. I can't imagine how much the table would weigh! What an intriguing little shop. Too bad they don't have something like this out here in California. I've been meaning to do a post on this little jewel of a shop, but now I will just enjoy the shopping experience and leave the camera at home. You captured its spirit perfectly.